Landslides in Arizona are an under-appreciated geologic hazard. Prior to this project, the nature and extent of landslides was limited to an incomplete array of geologic maps and reports. To address this knowledge and data gap, the Arizona Geological Survey (AZGS) initiated a Landslides Hazards Program. Working with our partner agency, the Arizona Division of Emergency and Military Affairs (DEMA), we compiled the first comprehensive landslide inventory for the State of Arizona. Cook, J.P. and 6 others, 2017, Building a Statewide Inventory of Landslides in Arizona, In De Graff, J.V. and Shakoor, A. (eds. ), Landslides: Putting Experience, Knowledge and Emerging Technologies into Practice, AEG Special Publication No. 27, p. 787-793. Land subsidence and earth fissuring have occurred in large portions of south ern Arizona, where they have caused a variety of structural damage and landmanagement problems. As Arizona’s population continues to increase, so wifi the demand for ground water. Subsi dence and earth fissuring wifi continue, extend into new areas, and create addi tional problems. The purpose of this report is to describe, in terms that are understandable to persons who are not trained in geology, what land subsidence and earth fissures are, why they develop, where they occur, what kinds of prob lems they create, and what can be done about them. Dedicated to the memory of Cathy Schulten Wellendorf (1956-1988). Slaff, S., 1993, Land Subsidence and Earth Fissures in Arizona. Arizona Geological Survey, Down-to-Earth Series 3, 32 p.
For the purpose of this directory, an active mine is defined as a mine in continuous operation, either in production or under full-time development for production. It is acknowledged that there are additional mines not listed that are in an exploration, evaluation, or part-time development phase. There are others where production is intermittent that are not listed. The authors compiled this directory during late 2006 thru mid 2007 by directly contacting the producers. Lists of possible producers were compiled from data of the department, MSHA, Arizona State Mine Inspector, U.S. Bureau of Land Management, U.S. Geological Survey among others. Also included here: Arizona Mines Map 2007 (pdf) and a Google Earth KML file containing the names and locations of active mines in Arizona ca. 2007. The latter requires Google Earth application to launch. Niemuth, N.J., Bain, D. and Kimbler, 2007, Directory of Active Mines in Arizona. Arizona Dept. of Mines and Mineral Resources D-51, 54 p., 1 map plate and 1 Google Earth kml file. Originally published by the ADMMR in 2007. Arizona has been a leading copper producer for the past half century. In most years, copper produced in Arizona accounts for more than 60% of all U.S. copper. The Primary Copper Industry of Arizona series, with annual reports from 1974 to 1992, contains information on production values from Arizona copper mines. Multiple authors, 1974 to 1992, Primary Copper Industry of Arizona - Annual Report. Arizona Dept. of Mines and Mineral Resources. Ruby Road washout associated with monsoon storm runoff of 27-28 July 2012. Visual narrative includes images of the washed out road, location maps, and rainfall from ALERT gauge at Pena Blanca Lake. Earth fissure map of the Bowie San Simon area of Cochise County, Arizona. Map scale is 1:24,000 and the map shows continuous, discontinuous, and reported but unconfirmed fissures. 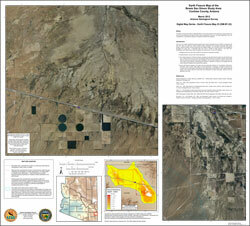 Arizona Geological Survey, 2012, Earth Fissure Map of the Bowie San Simon Study Area: Cochise County, Arizona. Arizona Geological Survey Digital Map DM-EF-23. One map sheet, map scale 1:24,000. Arizona Geological Survey. All rights reserved. On 3 May 1887, a magnitude 7.2 earthquake rippled across Sonora, Mexico, and southern Arizona. Phil Pearthree, Chief of the Environmental Geology division of the Arizona Geological Survey, revisits that event in this video. The earthquake killed dozens of people and damaged or destroyed several hundred structures. A similar event today would disturb and disrupt population centers in northern Sonora and southeastern Arizona and New Mexico. This ~ six minute video describes the physical and societal impacts of the estimated 7.2 magnitude Sonoran earthquake, which occurred on the Pitaycachi fault of the San Bernardino Valley, Sonora, Mexico. Seismic hazard analyses form the basis for the forecast of earthquake-induced damage to regions prone to seismic risk. Precariously balanced rocks (PBRs) are balanced boulders that serve as in situ negative indicators for earthquake-generated strong ground motions and can physically validate seismic hazard analyses over multiple earthquake cycles. Understanding what controls where PBRs form and how long they remain balanced is critical to their utility in seismic hazard analyses. The geologic and geomorphic settings of PBRs are explored using PBR surveys, stability analysis from digital photographs, joint density analysis, and landscape morphometry. An efficient field methodology for documenting PBRs was designed and applied to 261 precarious rocks in Arizona. An interactive computer program that estimates 2- dimensional (2D) PBR stability from digital photographs was developed and tested against 3-dimensional (3D) photogrammetrically generated PBR models. 2D stability estimates are sufficiently accurate compared to their 3D equivalents, attaining <8.8% error in estimated PBR centers of mass heights. Joint analysis reveals a mean PBR joint density of 0.39 m-1 with few PBRs formed in joint densities <0.22 m-1 and >0.55 m-1. Landscape morphometry shows that PBRs are situated in upper reaches of drainage basins near divides and hillslope crests. Surveyed PBRs are preserved on local hillslope gradients between 10° and 45°, and contributing areas between 1 m and 30 m. The close comparison between the 2D and 3D PBR stability estimates indicates that the program developed here may be used to quickly estimate PBR stabilities from digital photographs taken in the field within reasonable accuracy. The joint density results indicate that structural control on the bedrock from which PBRs are produced is critical vi to their formation and preservation; high joint densities create small boulders that completely decompose prior to exhumation while low joint densities create relatively large boulders that are stable. Morphometry results may help predict expected locations of PBRs in landscapes. More importantly, they caution that construction of PBR exhumation rates from surface exposure ages needs to account for their geomorphic location in a drainage basin given that spatial variation in PBR exhumation rates are controlled by the landscape’s geomorphic state. Haddad, D.E., and Arrowsmith, J.R., 2011, Geologic and Geomorphic Characterization of Precariously Balanced Rocks: Arizona Geological Survey Contributed Report CR-11-B, 213 p.
This contributed report stems from David E. Haddad's Master of Science thesis from the Active Tectonics, Quantitative Structural Geology, and Geomorphology, School of Earth and Space Exploration at Arizona State University. These guidelines provide professionals evaluating site-specific conditions in areas known or suspected to be subsiding with a standardized minimum level of investigation for land-subsidence and earth-fissure hazards. The guidelines do not include systematic descriptions of all available investigative techniques or topics, nor is it suggested that all techniques or topics are appropriate for every project. Variations in site conditions, project scope, economics, and level of acceptable risk may require that some topics be addressed in greater detail than is outlined in these guidelines. However, all elements of these guidelines should be considered in comprehensive land-subsidence and earth-fissure hazard investigations, and may be applied to any project site, large or small. These guidelines are largely modified from draft recommendations prepared by Lund and others (2010). That draft, in turn, was developed using existing guidelines for preparing engineering geologic reports in Utah (Utah Section of the Association of Engineering Geologist, 1986), guidelines for evaluating surface-fault-rupture and land-subsidence hazards in Nevada (NESC, 1998), and guidelines for evaluating surface-fault rupture in California and Utah (California Geological Survey, 2002; Christenson and others, 2003), with additions and comments from various professionals involved in land-subsidence and earth-fissure investigations. Arizona Land Subsidence Interest Group, 2011, Suggested Guidelines for Investigating Land Subsidence and Earth Fissure Hazards in Arizona: Arizona Geological Survey Contributed Report CR-11-D, 10 p.
The San Pedro River is divided into upper and lower reaches based on environmental and geomorphic contrasts (Tuan, 1962; Heindl, 1952a,b). The upper reach extends from the headwaters to "The Narrows," a bedrock constriction near Benson. The lower reach extends from The Narrows to the San Pedro River's confluence with the Gila River (Figure 1). A previous study of the historical geomorphology of the San Pedro River conducted by the Arizona Geological Survey for the Arizona State Land Department (Huckleberry, 1996) summarized the available published information regarding the nature and timing of channel changes along the upper and lower San Pedro River. Whereas there is an abundance of published information regarding the character and timing of channel changes along the upper San Pedro River, there is very little published information available regarding channel changes along the lower San Pedro River. Wood, L. M., 1997, HISTORICAL CHANNEL CHANGES ALONG THE LOWER SAN PEDRO RIVER, SOUTHEASTERN ARIZONA. Arizona Geological Survey Open File Report, OFR-97-21, 3 map sheets, map scale 1:24,000, 44 p.